as much as i loved tiptoeing down to the porch that wrapped around the grand old hotel, as much as i loved creaking in those old wicker rocking chairs, my palms wrapped round the mugs of first-of-the-morning coffee, the just-blooming, just-exploding viburnum and magnolia doing a perfumed waltz up my nose, i am home now, and already i’m thinking there is no place that soothes me quite like coming back in the door of the place that knows me, the place that i know, that i love, that keeps time right with my heart. we took ourselves a little road trip this week. not too far. not too long. down to nooks and crannies of the southern midwest, to hilly southern indiana, near where it brushes up against kentucky, and on over to kentucky, too. to where my roots begin. on a bit of a whim, we rode out to the itty-bitty country town of paris. yes, as in kentucky, 14 miles north and east of lexington. out to where my papa was a boy, out to the horse farms he knew like family, even though he lived in town, before they up and moved to the big city, to get my papa to schools his mama must have decided were a better fit for a boy with a school mind like his. the closer we got to paris, the more i missed my papa, missed him like i’d just left him yesterday but couldn’t ever get him back. i missed him so much my heart started to hurt as we rode along the road they call the paris pike, where century-old stone fences line the farms that roll, acre upon acre, blue-grass mile after blue-grass mile. i wasn’t quite sure how to get to the farm that we claim as our own, the one whose name you might find on the can of baking powder there at the back of your pantry. calumet is the one. calumet farm. and my papa grew up there; his big brother, the one he loved who died in the war, he ran the place, and all these years later, when i sit down to watch the derby, the kentucky derby of course, i hear someone whisper “calumet,” or i see the crimson-and-white silks the calumet jockey always wears, and my heart skips a beat. “our farm,” i think, as if a connection from back in the 1930s and ’40s, holds one drop of weight anymore. and sure enough, when we got there, the crimson iron gate was closed, all but locked. and the fellow who came to the phone let me know i wasn’t someone for whom they’d swing it open. place was closed for the day, he said loud and clear, made sure i heard it all the way at the end of the very long drive, even though we were talking over the dial-up intercom planted there by the gatehouse, and i heard every word all right. so i stood there on the outside of the locked, lacy ironwork, feeling quite wholly my place in its history: shut out. an insignificant afterthought. nothing more than a nuisance, there where they won’t let you in. but before that, when i’d stopped in the offices of the town newspaper, and told the nice ladies that my papa grew up there, and i was looking for calumet farm, well, they couldn’t have been kinder. they all but pulled out the kentucky pie, and a plate and a fork. all but poured me a cup of afternoon coffee. instead, they asked me my papa’s name. then they started to tell me all about his family, where they lived, where they went to church. i tell you, no one with his last name has lived there for a long long time. but in little towns like paris, kentucky, they remember. make you feel just like family, there in the newspaper office on main. but not at the gates of the farm now owned by someone altogether new. someone from far, far away, i’ve been told. for four days and four nights, i slept in beds that don’t know my particular lumps. drank coffee that wasn’t brewed in my pot. i walked and looked and listened, and found myself quite content, out discovering a part of the middle of america i hadn’t seen in a long long time, and other parts i’d never seen before. i do love mucking about, discovering, finding the familiar far far away. but, once again, as always, i discovered just a short while ago that the familiar that i love best, the familiar that soothes me through and through, is the familiar that i know by heart: the particular tick and tock of all our old clocks, the pit-a-pat of the old cat’s paws as he ambled down the steps once he heard us there in the kitchen. why, i love tossing old car-bumped apples back in the bin, finding everything there in the fridge where i left it, only a bit more wrinkled and the milk gone sour. i even found myself humming as i threw the first load of road-trip clothes into the wash, the machine whose groans and burps i know inside and out. coming home will always be the closest i come to purring, pure and simple. give me the floorboards that creak just where i know they will. give me the garden whose every bulb i tucked in that holy sacred earth. i’ll miss those front-porch rocking chairs, come morning. but the coffee will be just the way i like it, with two or three shakes of cinnamon, there on top of the mound before i close the lid and wait. back home in my kitchen, humming. what do you love best about coming home? or are you a travelin’ soul? 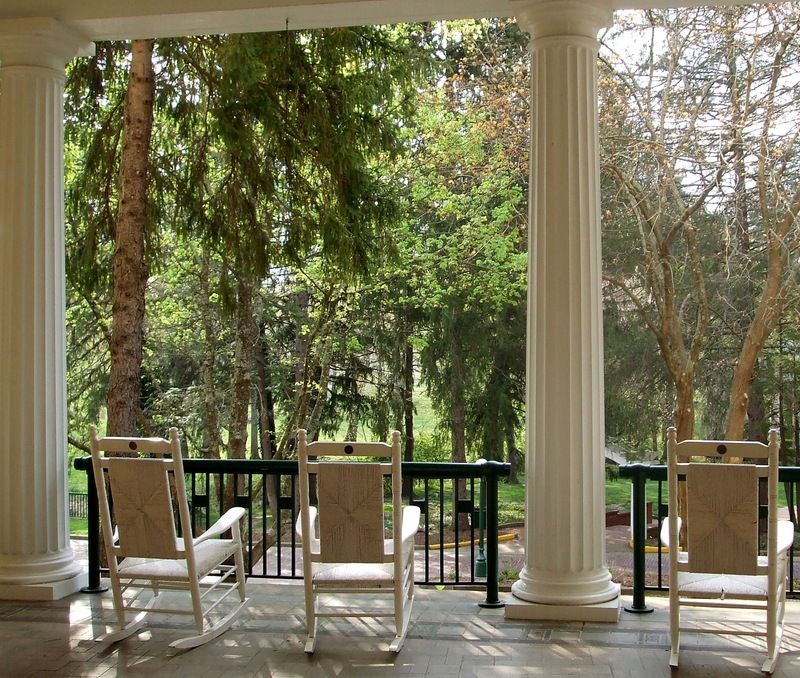 and just in case you are interested, that lovely porch and those rocking chairs can be found at the west baden springs hotel, in west baden, indiana, just this side of the hoosier national forest, not far from brown county, a place worth a road trip, indeed. one last bit of homecoming joy: my mama, closest thing i know to a saint plenty of days, she came by to stock the fridge and leave two fat bouquets of viburnums on the countertop, right beside the kitchen sink, so when we walked in from the road trip, first thing i inhaled was the viburnum waltz, same as the one that made me swoon back on the west baden’s wrap-around porch. oh, i wish there was a smell button here, so i could waft it right by your nose. you’ll just have to close your eyes now, and pretend. 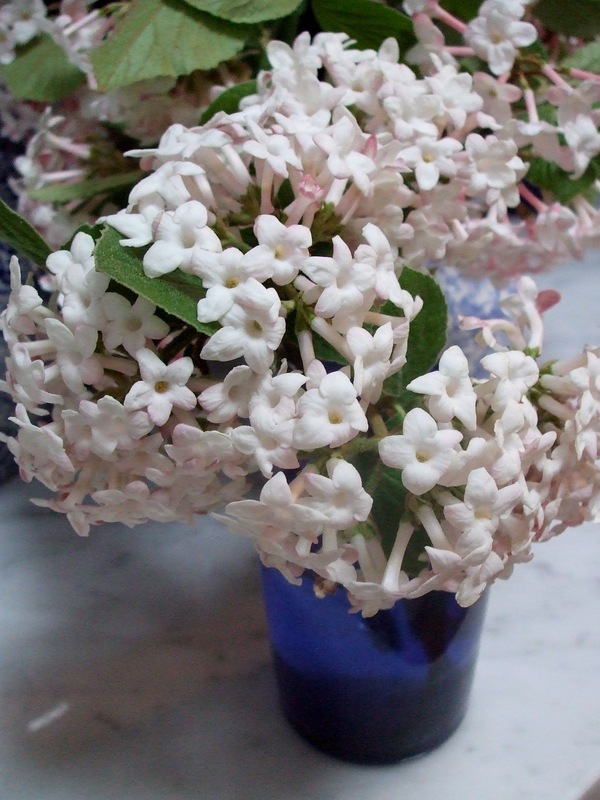 try this: imagine what heaven would smell like, if it bloomed on a bush. there is an art to being still, and i am practicing. the birth of the day, it seems, is the hour that calls me. and, actually, all i’m going for is a mere slice of that hour. ten minutes, for starters. for beginners like me. there is little hope, i figure, of trying to squeeze it in, in the thick of the day, between all the rushing and dashing and typing and trolling for words. and, at the end of the day, when the blanket of stars are out and the house is winding down to a hum, i figure my brain has gone blank, in that numb — not that crisp — sort of a way. or, worse, it’s so overstuffed by that hour that all i’d do is churn and re-churn whatever the day had left in its wake. there’d be no stillness within. it’s hard enough at the dawn. hard enough to keep the tick-tock at bay. before the first dabs of light are soaking the low-down sky, i am tiptoeing out of my bed, stumbling downstairs, grinding my coffee beans (a wake-up noise, i tell you, that might be essential, at least till i’m through with the whole-bean bag i didn’t fully intend to grab from the grocery shelf). the cat, always hungry, demands his share of my morning attentions — and a scoop from the tin in the fridge. then, warm mug cupped in my palms, i reach for the door, and step under the holiest dome, the dome of the dawn as it breaks into double-time spring. and that’s when it hit me, my first morning out: i’d just stepped into a cauldron of birdsong soup. there were so many layers of so many sounds, coming from so many places, my ears — at first — could barely pick it apart. there were trills and caw-caws and whistles and chatter. short notes and fat notes. and notes that seemed without end, twisting and tumbling and climbing again. notes most insistent, and notes that dribbled off, into ellipses. it seemed, pretty much, a gymnastics meet of bird sound. all those itty-bitty throats and tongues and lungs thrusting and lunging, spinning and twirling. all that was missing was chalk dust and numbers pinned to their backs. and it all, all at once, seemed to be moving, whirling around me, as one song took flight, and soared to a nearby limb. or criss-crossed the sky. or merely hopped down the branch, in search of a cozier, noisier perch. it was surround-sound at its most heavenly, this ever-circling orchestral creation, powered by wings and lungs whose weights would be measured in grams. a whole-bodied chorister not even one ounce. and all i knew that very first morning was that everywhere i listened, there was a full-throttle sound track not to be missed. one i’d too often slept through. or, sadder, ignored in my packing of lunches, and checking of schedules. it wasn’t as if this was new, this spanish moss of bird song, dripping from trees. it’s been there, just beyond the panes of the windows, the other side of the door. it was only that i’d not carved out the wisp of an hour, made room for the stillness, so that what was there all along could make its way into my eardrums, and down to my soul. once my head stopped spinning, i did what any student of stillness must do: i planted myself firmly, solidly, on the seat of the bench in my not-so-secret garden, the one that runs along the kitchen, the one that meanders, the one that catches the morning’s first light. i tried not to think, just to be. one with the birdsong. and i started to look, not to glance but to study. it wasn’t hard, what with the week’s thermometer cranked up to summertime, to notice how spring was galloping out of the ground. i sat and watched chives grow, those early-spring straight-backed soldiers of pungence, the ones i’m already snipping for lox and sprinkling on cream cheese, not unlike bits of newly-mown grass that i bring in for breakfast. and then, just down the walk, i spied the bleeding heart. overnight, or so it seemed, it had emerged, a jazz ensemble of cut-leaf precision and a green so velvety green, it made me want to pluck it to wear it. wrap it round my bare shoulders, or better yet make it into a slip and let the morning breeze play between it and my skin. i have to admit, stillness didn’t come easy. wasn’t a natural fit, not for me, anyways. before my 10 minutes was clocked, i was itching to dig in the dirt. i’d tallied a list that beckoned me and my ministrations: the climbing hydrangea that needed a lifeguard, weeds that might do with a shrill short blast of a whistle, demanding they stop in their trespassing tracks. but i also noticed this: the longer you sit in rapt silence, utter attention, the deeper you sink into the whole of it, the line between you and the earth and the sky and the dew all but evaporating. my next morning out, it was chilly. and a soft morning’s rain added its backbeat to the birdsong. so i sat with my stillness on an old wicker chair, inside the porch with the screens. from across the garden, and under the pines, i listened to raindrops measuring time with the ping-ping-ping from the downspouts. while it’s not yet under my skin, this time-out for the soul, i can feel it working its way to the wellspring, this sacred act of tiptoeing out of bed to catch the morning unaware. i’ve a sense that sprinklings of wisdom might fall on that place deep inside where the knowing is. and in the calm of the dawn, i might remember the words to the prayer that, for too long, have been dimmed. and very much missing. 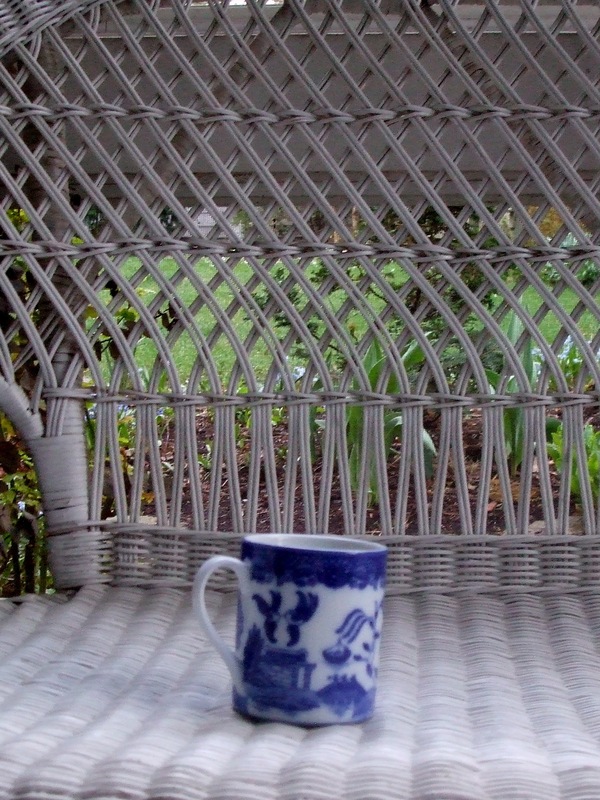 do you practice stillness? how do you weave it into the hustle and bustle of your everyday? it didn’t take long for me to notice. even in the whirling dervish early days of this experiment in life after newsprint, even when i was madly tearing open boxes, squatting on the floor and sinking into news clips from a quarter century ago, i found myself bumbling into moments that opened into something that can’t be hurried, can’t be rushed, can’t be made to unfold. they were the moments when my little one looked up at me, grabbed onto the loophole of time and slowed it all down. allowed the magic to seep in. oh, there were no cymbal crashes. no serenades in the background. sometimes, just the simple glug of milk galumping out of a jug and into a glass. a glass that had been set out. waiting. long ago, my little one told me he loved it when he bounded in the door and found the plate and the glass there on the counter. my little one, for a boy who’s wrestled with words in one way or another over the years, is a master of speaking straight from the heart. what he was saying is what all of us, deep down inside, wish for: mama, give me a sign that you pondered my coming back home. leave me a clue that you waited, that you made a place for me — at the counter, yes, but truly deep in your heart. that’s why, isn’t it, we swoon when we see chocolate cakes under proud glass domes. 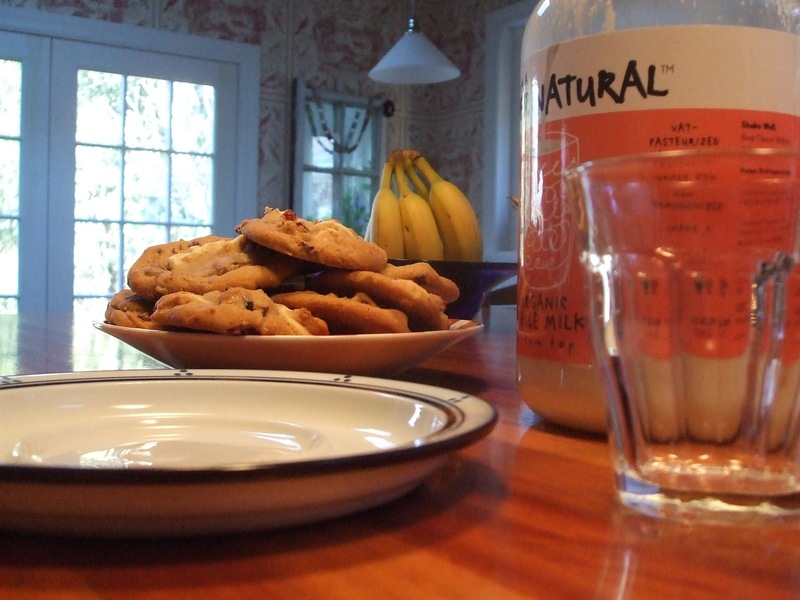 why waxpaper-lined tins of chocolate chip cookies can make our knees all buckly. that’s why, when we tiptoe into the pantry, and find a box of our very favorite girl scout thin mints there on the shelf, we break out in a smile. goodness. i don’t mean for this to plumb the depths of after-school snackings. the subject here, despite my dilly-dallying and detour, is a certain brand of magic, the magic of a mama’s slowed-down watch. and how it stirs me back to all my deepest senses. indeed, the magic i’ve been bumping into of late has come in other sorts of moments, too. ones that had nothing to do with milk pouring from a stout glass bottle. the moments when instead of shaking the poor child from slumber, barking over my shoulder that he had to hurry because i had a train to catch, i plopped myself on his bed, woke him up with the palm of my hand rubbing circles on his still-soft 10-year-old skin. the moments have come when i was there to peek over his shoulder as he tried to figure out why one fraction equalled another. when i wasn’t stumbling in from downtown, wasn’t still trying to shake off some nasty thing someone had barked at the office. instead, these past hours that have turned into days and weeks and more than a month, i have stumbled back into the holy grace of the poetry that’s there, waiting to be scooped up in bare hands or buckets, when you slow it all down, allow the rhythm of your life to unfold in legato, not staccato, time counts. when you tune your heart’s clock to its deepest truest measure: the one that reaches out and connects with the ones you birthed, you rocked as a baby, the ones whose every plane and bump and crevice you once knew by heart. as you cradled that squirmy 8-pounder, day after day, in the bath or the changing table or propped up on your shoulder, back in the days when you could not chop a potato or bite into an apple without that little someone demanding attentions and intercessions in duplicate and triplicate depending on the day — and the belly aches and the never-ending hungers. when you put your hand to the knob as you see that child stumbling up the walk, under the weight of books and backpacks that seem too much for a mere lad of one decade. when you are there in the parking lot, waiting in the old wagon, the one without hubcaps because of the snow tires, the one that sticks out from all the shiny SUVs, when you happen to have thought to throw a granola bar and a banana into the back seat. just in case that someone is hungry after all that tossing of balls and chasing up and down yet another court. when you find yourself scrubbing the suds off a plate, just across the counter from where the homework has been dumped from the backpack, and you are there to hear the words, “oh, wanna hear a funny thing?” and then you listen to the story that would have gotten lost had you time-crunched a day in the life of a fifth-grader into the two hours between dashing in from the train and tucking the storyteller into his bed. they are but wisps of moments, these moments i am now catching, as if a butterfly hunter out in the woods with my long-handled net. they are whispering moments. moments you might not notice, and might not realize you’re missing. but when you catch them, when you hold them up in the sunlight, when you turn them and spin them, and take them in from all angles, you realize they are the holiest of sparks in the landscape that is your life. they are the rare few moments here on earth when our presence matters. when we open our eyes and our ears and our hearts, and reach out from inside where all the loneliness lives, and we find ourselves — in quotidian gestures, opening doors, putting out plates, tucking in sheets — doing God’s work, the work of letting the souls in our midst know that they matter, that their load is lifted, is shared, is lightened. because there’s a mama right there. a mama who loves that child through and through and inside out and upside down. and she’s slowing down, in whatever ways she can, to seal that message to the deepest place in the heart. isn’t that the essence of why, in the end, we’re alive? i know full well that not every one of us has birthed the ones we mother. i don’t believe that birthing need be part of that equation, though if you’ve been there when the first squawk came, it’s a rush and a flood that forever propels your heart. so maybe you play out the mama gene with someones other than a child. and maybe you need to play it out in double-time, because you find yourself firmly in the fast lane of life. but however we play it out, isn’t it synonymous with the very definition of loving, love as you would wish to be loved? isn’t that a mama’s — or anyone’s — holy mission here on earth? do you have a story of being loved that way? and if it wasn’t your mama who loved you like that, was there someone else? do you catch yourself in those whispered moments when you find it inside yourself to lift up another someone’s heart as if your lives — your own and that someone else’s — depended on it? the sunrise stirred me. out my window, all was pink, was orange, was afire. someone had grabbed at the paint set, was streaking the lowdown corner of sky, the one i could see from my pillow. i awoke to the heavens this morning. i’m beginning to do that, set my clock by the sun and the moon again. i am beginning to tell, once again, what the time is, just by watching the way the sunbeams slant through the glass, spill over the floorboards, sink into the pillows. even at night, when i’m up tiptoeing, i’m catching the moonbeams. the way they play off the panes of the windows, dance through the lace of the tree limbs. i’ve even found moments for walking the blue stone path that winds through my not-so-secret garden. i am watching spring push through the earth. day by day, frame by frame, i track the resilience of tender green nubs. 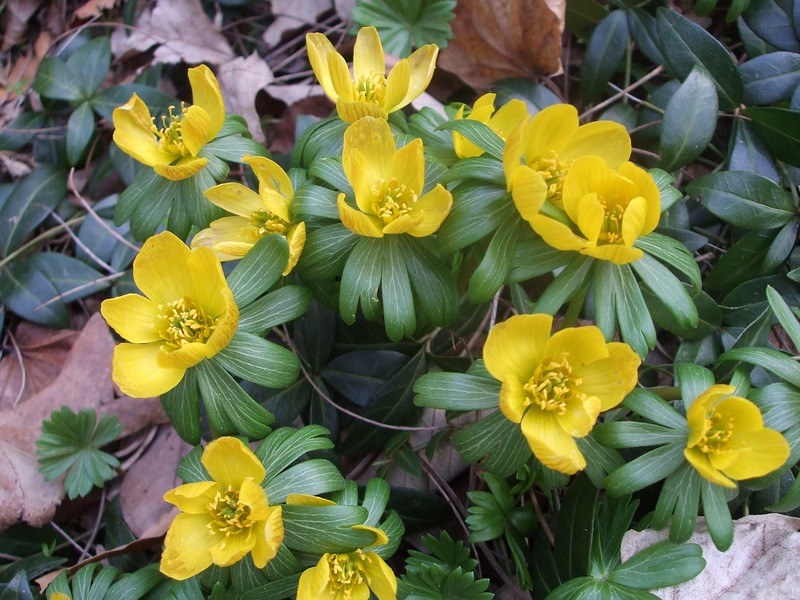 one by one, the choreography that comes from all that autumnal digging and tucking in promise, it makes itself known: winter aconite, wee yellow stars that open and close with the sun, followed by snowdrops, followed by crocus. they are all out there beginning the dance, exhaling hope. and i am drinking it in. i am plugging back in. the mad dash from house to train to faraway office is no longer. once the door slams shut for the very last time in the morning, i am alone, am quiet. oh, there is work to be done, every day for hours and hours. but, in wisps and stanzas and pauses between places and thoughts, i am beginning to look up from what i’m doing, where i’m going, and notice. i’m catching the light. inhaling the song. i am breathing again. i seem to hum most contentedly when my canvas has room for the paint dabs of God. when i hear the wind rustling through pines, when i take in the scarlet flash in the bushes just beyond the window, when i trace the shift in the shadows through the long afternoon, that’s when i feel the great hand of the divine slipping round mine, giving a squeeze. that’s when i know i am not deeply alone. but rather more connected than in a very long time. it was here, in the quiet of this old house, that i discovered how very much my lungs are filled by the scritch-scratch of heaven’s stirrings here on earth, in the trees, in the sunlight, in birdsong. in my garden. and while my days are plenty packed, it’s the silence of the interlude that glues me together. the grace of time to laugh out loud at a persimmon-breasted robin perched on the window sill. the chance to take in the picture show of spring on the brink, knowing this time around i won’t miss a frame. the wordless prayer that fills my heart as i hear the rumble of thunder far off and rolling closer. i take my religion in the gulps and sips that come to me when heaven taps on my window panes. and once again i am home to hear the tapping. what are the ways that you plug back in to that which makes you whole — or holy? here is where the white begins. white is quiet. white whispers. white welcomes you into its folds. white is lace handkerchief tucked in my grandma’s pocket. white is pure cotton sheets, drying on the line where the sunshine and breeze do all the work. as she traipses through her victorian beds, her riotous plantings that broke out of the corseted ways of the times, dear gertrude notices all of the many, many shades of white: there is milk-white, and lemon white, and, yes, at last there is clear white. 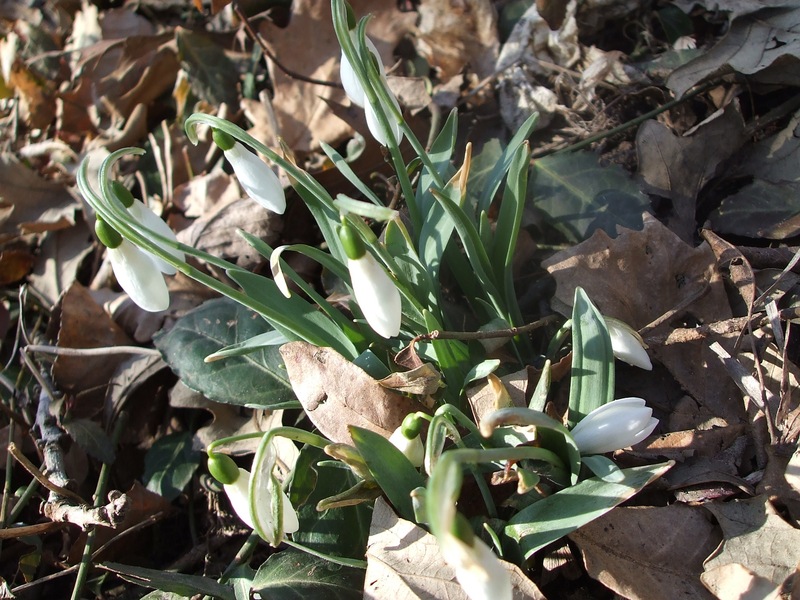 there are first snowdrops poking through late winter’s crust, banners of hope, periscopes from the underworld, looking out to see if it’s safe yet. might it be time to tiptoe onto the landscape, they ask. they dare ask. and so we, too, come to this landscape of pure cotton sheets, of gardenia petals, of damask dinner napkins lifted out from the mothballs. of the pages of old, favorite books. of snow as it falls. here we are, in this new place, where soon enough we will settle in, will feel like old home. oh, sure it might take some getting used to. but i’m beginning to think of the beauties of the unfettered slate. of the wash just after its folded, when the smoothed-out wrinkles wear proudly their scrubbed-up whiteness. as far back as i know, white has been the color of choice for the papers on which ink spills. at least when the mission is words. inky black on parchment white. we’ll give it a whirl. and before i leave this welcome postcard, i’ve brought along poet mary oliver, who i trusted would have had something to say about white. please, let me know if you’re warming to white…. oh my goodness. i am filled to the brim here today, as i type these white keys on the black page. chalk to the chalkboard i always thought of it. all these five years, two months, two weeks and five days. oh, i’ve heard grumbles now and then. hard to see. makes folks eyes do the wazzle-dazzle, which means the albino letters get all wobbly, do a dance on the black velvet curtain, and it’s impossible to read. i’ve always found it homey. but then i like cloudy days, a gray november day is some of God’s best artwork, far as i’m concerned. so it’ll be a bit like taking off the sunglasses when we up and move over the weekend. when we kiss iWeb goodbye, this lovely little paintset that all these years has let me play here, write my heart out, let you join in on the hearty conversation. in the nine gazillion changes underfoot, i found out not so long ago (where was i when the smoke signals went up?) that ol’ iWeb will soon be obsolete, and mobileMe, the cloud that carries the chair to all your houses, it is evaporating come summer. it’s pretty much like finding a bright orange eviction notice slapped on your front door. or parking in some illicit spot downtown and finding a big ol’ chicago police department clamp on your back right wheel. while you were away, the sheriff came and booted you. so as long as i was leaping out of airplanes in the last few weeks, i decided now’s the time to make the one last leap. we are moving, you and i and all our chairs and the kitchen table too. and worry not, i won’t forget the old milk pitcher, the cracked one up above. i’ll haul it along. with all the coffee mugs and spoons. all you have to do is ring the same old doorbell. i’ll be there, waiting on the other end. i’ve been doing all the packing for the last few days. trying to make it all cozy over in the new place. the walls are white. and some of you — though you’re not here reading, because you told me long long ago that you would not read a place where words come out all chalky white on slate — well some of you will be tickled to learn that the new place believes in black letters on white walls. just like in the old days, when you could count on ink getting smeared all over your mitts as you read the morning’s news. i up and moved — with MAJOR assist from the chief technical saint, my little brother bri, who swooped on a cape and saved the day when i thought the chair was forever lost — every last one of the 523 daily meanders that have meandered here, and soon as i’m done with this one, making it a neat 524, i’ll carry this one over there too. sort of like when the moving van takes all the big stuff, and you throw one last lamp there beside you in the passenger seat, lest it get left behind. 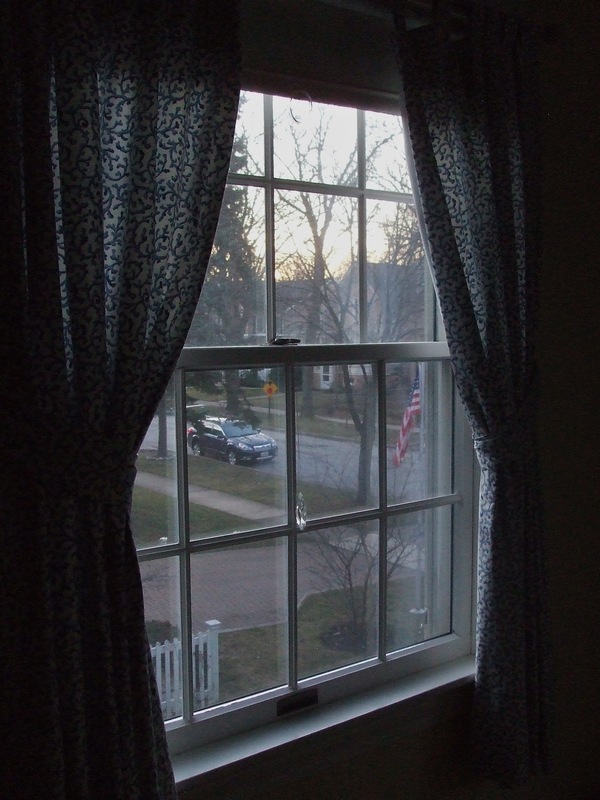 it might take a while to get the curtains up, to make it all pretty again. for one thing i have a full 524 photos to move, one by one. and somehow the paragraph indentations all got lost. can you even begin to guess how many paragraphs need to be indented? oh lord, does anyone know a 1-800 listing for the paragraph patrol? as with any move, i’m a bowl of floopy noodles over here. part of me is sad to leave this place that’s been such a fine home for me, and my heart. and the words that spill here. this ol’ house was built with and by my sweet college boy. back when he was just an eighth-grader. i loved the way he sat down that long ago december’s night, and started poking buttons and next thing i knew he had me shoved out the window and onto the blogosphere. where would we be without the ones who push us from behind when we don’t realize how very much we need the shove? i might walk around one last time. peek in corners i’ve not seen in a long long time. wipe off the last of the cobwebs, then take one big brave breath, and pull the shades. 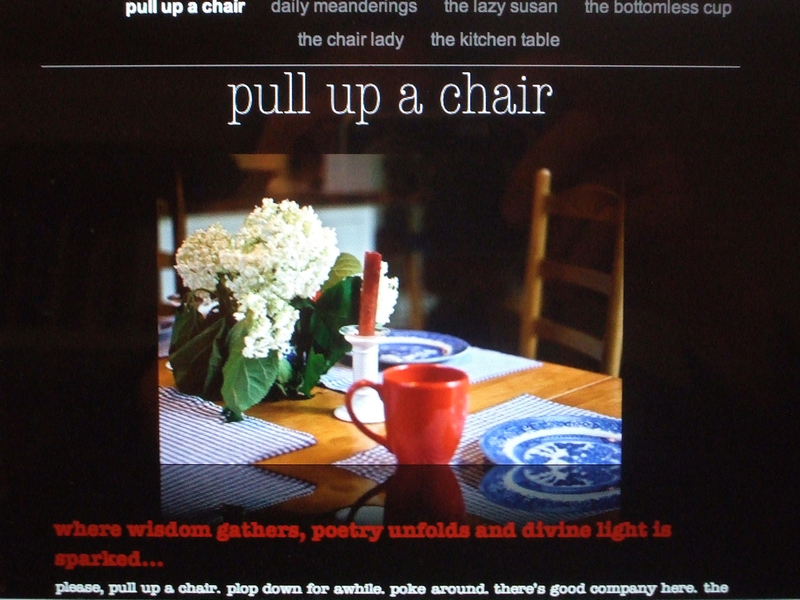 there’s a new place waiting for all of us to pull up chairs. and it’s a spiffy place. it’s got tricks and marvels i can’t begin to grasp. not yet anyway. for starters, i don’t think you’ll ever be tangled again in the darn comment snags, the ones here on iWeb that sometimes let you pipe up and add your thoughts, and sometimes kept you banging on the window, trying to get someone to let you in. i never much like change. i could wear the same old pair of slippers till my big toe pokes through (and it is, even as i type). i wouldn’t notice if a rug was worn to the threads. it’d be the same old beautiful rug it was the day i brought it home. so this moving thing gives me the wobbles too. and i’m all worried you won’t find it cozy. but it’s clean. and we’ll all be together. and the coffee will never stop percolating there on the cookstove. give me a wee bit of time to gussy it up. the other night, when i thought the chair was lost, when i thought our zillions of heart beats shared would never ever see the light of day, i cried myself to sleep. real tears. poured onto my pillow. oh, sure, these are just computer keys that i push down with the pads of my fingers. but you all know the secret: they are wired straight to the nerve center of my heart. this is all virtual, indeed. but what spins from here is as real as anything i have ever known. and it is propelling me, keeping me airborne. just one last thing: have i told you lately that with all my heart and all my soul, thanks for coming all these years. now, let me grab the coffee and let’s get goin’ down the lane. we’ll make it just right. i promise. you’ll find us, wherever we are….